Condo Association committees can have a tremendously positive impact upon your community. When they are managed correctly, their ability to contribute and make your community a better place to live is significant. In the last edition, we covered several important ideas for Condo Association facilities Committee projects. These included an environmental review, landscape review, and security review. In this post we give you three more Condo Association facilities committee projects to keep your Condo busy and your community improving. 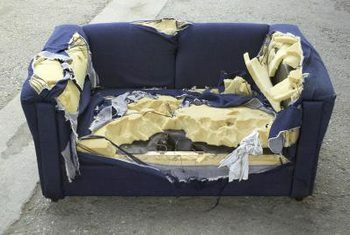 It might be time for some new furniture! Interior decorating is often an intensely emotional and crazy experience in Condo Associations. Everyone has an opinion, and no one agrees. But you can make smaller gains by focusing on a more limited scope, such as a furniture refresh in common areas. Keep your scope targeted based on your budget. Focus on your lobby, your lounge, or maybe an outdoor area. Look at options such as reupholstering as opposed to all new furniture. But if you are looking to buy furniture, make sure you pick durable, stain resistant pieces that can handle the wear-and-tear. The same tricks to save money when you buy personal furniture can work for your Association, as well. Try to time your purchase around a major sale, or use coupons to get a big discount. Effective signage may not be the sexiest thing you can think of, but it does have a substantial and lasting impact upon your Condo Association. This review can take several different forms. For example, you might look into replacing or updating the sign for your building. Often these are called “monument” signs, but they can also be billboards or other signage. This is the first thing a visitor or prospective buyer sees when they come to your building. And you never get a second chance to make a first impression. A sleek, modern, up-to-date sign makes a big difference, and often the prices are very reasonable. Parking spaces are literally gold for Condo Associations. Treat them as such. Parking is one of the hottest commodities in a Condo Association. Numerous factors will drive whether you are parking rich or parking poor. Do you have surface lot spaces? Is it all garage parking? What is the street parking like? You also might have different types of parking spaces. You’ll have guest parking, owner parking, contractor parking, and you might also consider super short-term parking (an hour or less) targeted at prospective buyers or residents unloading groceries. Figuring out if all of your parking is optimally utilized is one of the most ambitious Condo Association facilities committee projects. It also can end up being one of the most beneficial. If you can identify the potential to create new spots and deed them, or re-allocate spots that are underutilized, your Owners will be beaming. There are numerous opportunities to improve your community through these Condo Association facilities committee projects. The great thing about these is that they all focus on comparatively lower materials and capital costs, and instead focus on actions which volunteers can carry out. Ideally you could build these into your budget, but many of them are cheap enough that you can do them with any leftover money at the end of the year. Improve your community and lead a better Condo life.